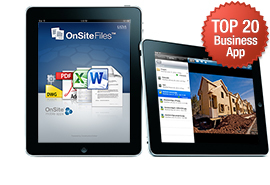 UDA Technologies's new mobile application, OnSite Files for iPad, has vaulted into the iTunes Top 20 Free Business Apps. OnSite Files for iPad was made available for download on July 29, 2010, and in the first four days, a rush of downloads gained quick notice. This high download rate has also led to iTunes selecting OnSite Files as one of the twenty New and Noteworthy Apps and their ranking as #16 of iTunes Business Apps.